Up until earlier this year, if I ever had my nails done then I would always have Calgel on them which looked lovely but it wasn’t strong enough and lifted very easily. Back then, my top coat of choice was the Calcrystal UV Top Coat which I used on top of the gel to stop my nails from staining yellow and if I painted them then it would also protect the polish the same as any other top coat. When I stopped having my nails done with the gel I just continued using the same top coat and didn’t really explore any others out there. 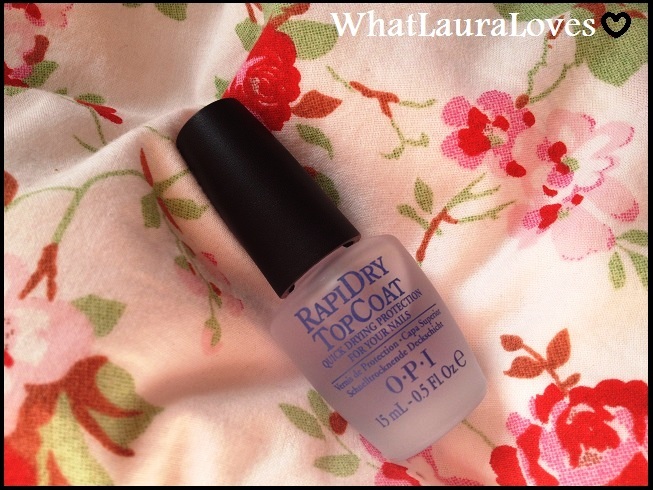 In truth, the Calcrystal top coat was great to use on top of french manicured gel nails but it didn’t really do much for natural nails so when it ran out, I was keen to try out some others and this little gem is what I’ve found. The RapiDry Top Coat from OPI is excellent. It has a smooth formula and texture, not too runny and not too thick. It glides onto the nails without dragging the polish underneath and really seals in the polish to protect it from chipping. My nail polish lasts loads longer with this top coat on than without; take Elephantastic Pink from OPI for example, I usually get about 2 days on my natural nails and 4 days on acrylic nails without a top coat, whereas with the RapiDry top coat from OPI I get at least one week chip free out of my nail polish, that’s definitely worth a perfectly manicured thumbs up! RapiDry dries in record time too literally as soon as I’ve moved on to painting my other hand, my first hand it dry, which is perfect for those of us who are on the go. I love how shiny and polished Rapidry makes my nails look. Even if there’s a messy application of my initial polish or if I’ve caught my nail when the polish was still wet and smudged it then the Rapidry seems to sort this out, leaving my nails looking even and perfect!